Echinocactus is a genus of cacti in the subfamily Cactoideae. 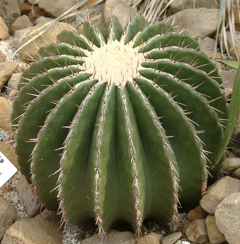 The generic name derives from the Ancient Greek εχινος (echinos), meaning “spiny”, and cactus. 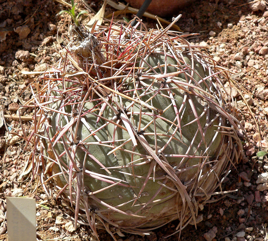 It and Ferocactus are the two genera of barrel cactus. Members of the genus usually have heavy spination and relatively small flowers. 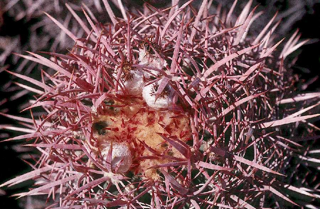 The fruits are copiously woolly, and this is one major distinction between Echinocactus and Ferocactus. Propagation is by seed. 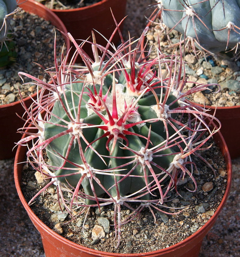 Perhaps the best known species is the golden barrel (Echinocactus grusonii) from Mexico, an easy-to-grow and widely cultivated plant. Though common in the houseplant and landscape industry, the golden barrel has become very rare in habitat. 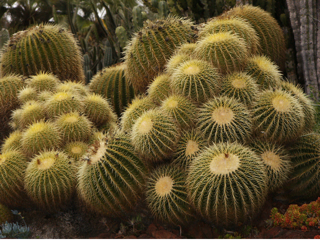 From the Greek echinos (porcupine, hedgehog) and cactus, referring to its spines. 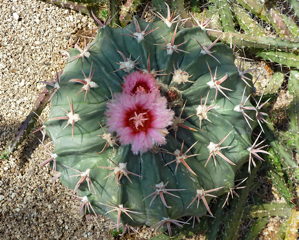 From the Latin ferus, (fierce) and cactus, referring to its heavy spines. Named for Hermann Gruson, 19th century German collector, nurseryman in Magdeburg. From the Greek platys (broad) and kantha (thorn). Of or from Texas (U.S.).